After completing his PhD at the University of Cambridge in 2000, Dr Bogdan Stefanski was a Post-doctoral fellow at the Max Planck Institute for Gravitational Physics in Potsdam and a FOM (Foundation for Fundamental Researchon Matter) research fellow at the Spinoza Institute in Utrecht. In 2004 he moved to Imperial College where he was a Marie Curie Intra-European Research Fellow and an EPSRC Advanced Research Fellow. Between 2008 and 2009 Bogdan Stefanski held a Marie Curie Outgoing Research Fellowship at the Massachusetts Institute of Technology and Imperial College. He has been at City University since 2009 where he is an EPSRC Advanced Research Fellow and Lecturer. Bogdan Stefanski is interested in all things string theory. String theory has led to a number of important developments in theoretical physics including a consistent quantisation of gravity, a natural framework for supersymmetry (a conjectured symmetry of bosons and fermions, currently being searched for at the Large Hadron Collider at CERN in Geneva) and a deaper understanding of geometric objects such as Calabi-Yau manifolds and Seiberg-Witten invariants. Despite being around the theoretical physics landscape for over 30 years, string theory is far from being fully understood - new and exciting surprizes about its properties are frequently uncovered. One of the most impressive such surprises is the remarkable conjecture made by Juan Maldacena in 1997. In it he postulated that a strongly coupled four dimensional gauge theory (a generalised theory of nuclear interactions) was in fact described by a 10 dimensional string theory. 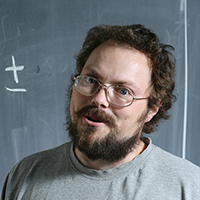 Much of Bogdan Stefanski's recent work has focused on unravelling the stringy aspects of this correspondence: how can a 10-dimensional string theory 're-package' itself into a gauge theory? Stefanski, B. (2002). Orientifolds, discrete torsion and twisted equivariant K-theory. Workshop on the Quantum Structure of SPIRES Conference C02/09/13. Stefanski, B. and Braun, V. (2002). Orientifolds and K theory. SPIRES Conference C02/06/25.2. Stefanski, B. (2002). D-branes, orientifolds and K theory. Workshop on the Quantum Structure of Spacetime and the Geometric Nature of Fundamental Interactions 13 Sep 2001 – 20 Sep 2001, Corfu, Greece. Stefanski, B. (1999). WZ couplings of D-branes and O planes. Bombardelli, D., Stefanski, B. and Torrielli, A. (2018). The low-energy limit of AdS(3)/CFT2 and its TBA. JOURNAL OF HIGH ENERGY PHYSICS, (10). doi:10.1007/JHEP10(2018)177 . Stefanski, B. and Ohlsson Sax, O. (2018). Closed Strings and Moduli in AdS3/CFT2. Journal of High Energy Physics, 5. doi:10.1007/JHEP05(2018)101 . Baggio, M., Sax, O.O., Sfondrini, A., Stefański, B. and Torrielli, A. (2017). Protected string spectrum in AdS3/CFT2 from worldsheet integrability. Journal of High Energy Physics, 2017(4). doi:10.1007/jhep04(2017)091 . Borsato, R., Sax, O.O., Sfondrini, A., Stefański, B. and Torrielli, A. (2017). On the dressing factors, Bethe equations and Yangian symmetry of strings on AdS3 × S 3 × T 4. Journal of Physics A: Mathematical and Theoretical, 50(2). doi:10.1088/1751-8121/50/2/024004 . Borsato, R., Sax, O.O., Sfondrini, A. and Stefański, B. (2016). On the spectrum of AdS3 ×s 3 ×t 4 strings with Ramond-Ramond flux. Journal of Physics A: Mathematical and Theoretical, 49(41). doi:10.1088/1751-8113/49/41/41LT03 . Borsato, R., Ohlsson Sax, O., Sfondrini, A. and Stefański jr, B. (2015). The AdS3× S3× S3× S1worldsheetSmatrix. Journal of Physics A: Mathematical and Theoretical, 48(41), pp. 415401–415401. doi:10.1088/1751-8113/48/41/415401 . Sax, O.O., Sfondrini, A. and Stefanski, B. (2015). Integrability and the conformal field theory of the Higgs branch. Journal of High Energy Physics, 2015(6). doi:10.1007/JHEP06(2015)103 . Lloyd, T., Ohlsson Sax, O., Sfondrini, A. and Stefański, B. (2015). The complete worldsheet S matrix of superstrings on AdS3×S3×T4 with mixed three-form flux. Nuclear Physics B, 891, pp. 570–612. doi:10.1016/j.nuclphysb.2014.12.019 . Borsato, R., Ohlsson Sax, O., Sfondrini, A. and Stefański, B. (2014). Towards the all-loop worldsheet s matrix for ads3×s3×T4. Physical Review Letters, 113(13). doi:10.1103/PhysRevLett.113.131601 . Stefański, B. (2014). Supermembrane actions for Gaiotto-Maldacena backgrounds. Nuclear Physics B, 883(1), pp. 581–597. doi:10.1016/j.nuclphysb.2014.03.028 . Lloyd, T. and Stefánski, B. (2014). AdS3/CFT2, finite-gap equations and massless modes. Journal of High Energy Physics, 2014(4). doi:10.1007/JHEP04(2014)179 . Borsato, R., Ohlsson Sax, O., Sfondrini, A. and Stefánski, B. (2014). The complete ads<inf>3</inf> × s<sup>3</sup> × t<sup>4</sup> worldsheet s matrix. Journal of High Energy Physics, 2014(10), pp. 1–73. doi:10.1007/JHEP10(2014)066 . Borsato, R., Ohlsson Sax, O., Sfondrini, A., Stefański, B. and Torrielli, A. (2013). Dressing phases of AdS3/CFT2. Physical Review D - Particles, Fields, Gravitation and Cosmology, 88(6). doi:10.1103/PhysRevD.88.066004 . Sax, O.O., Stefanski, B. and Torrielli, A. (2013). On the massless modes of the AdS3/CFT2 integrable systems. Journal of High Energy Physics, 2013(3). doi:10.1007/jhep03(2013)109 . Borsato, R., Sax, O.O., Sfondrini, A., Stefanski, B. and Torrielli, A. (2013). The all-loop integrable spin-chain for strings on AdS3 × S 3 × T 4: The massive sector. Journal of High Energy Physics, 2013(8). Colgain, E.O. and Jr, S.B. (2011). A search for AdS(5) X S-2 IIB supergravity solutions dual to N=2 SCFTs. JOURNAL OF HIGH ENERGY PHYSICS, (10). doi:10.1007/JHEP10(2011)061 . Stefanski, B. and Ohlsson Sax, O. (2011). Integrability, spin-chains and the AdS3/CFT2 correspondence. High Energy Physics, 1108, p. 22. Reid-Edwards, R.A. and Stefański, B. (2011). On Type IIA geometries dual to N=2 SCFTs. Nuclear Physics B, 849(3), pp. 549–572. Reid-Edwards, R.A. and Stefański Jr, B. (2011). On Type IIA geometries dual to N = 2 SCFTs. Nuclear Physics B.
Babichenko, A., Stefanski, B. and Zarembo, K. (2010). Integrability and the AdS(3)/CFT2 correspondence. J HIGH ENERGY PHYS, 1003(3), p. 43. doi:10.1007/JHEP03(2010)058 . Stefanski, B. (2009). Green-Schwarz action for Type IIA strings on AdS(4) x CP**3. Nucl.Phys., B808, pp. 80–87. Stefanski, B. (2007). Landau-Lifshitz sigma-models, fermions and the AdS/CFT correspondence. JHEP, 0707, p. 42. Stefanski, B., Maiden, J. and Shiu, G. (2006). D-brane spectrum and K-theory constraints of D=4, N=1 orientifolds. JHEP, 0604, p. 39. Stefanski, B. and Tseytlin, A.A. (2005). Super spin chain coherent state actions and AdS(5) x S**5 superstring. Nucl.Phys, B718, pp. 83–112. Stefanski, B. and Tseytlin, A.A. (2004). Large spin limits of AdS/CFT and generalized Landau-Lifshitz equations. JHEP, 0405, p. 35. Stefanski, B. (2004). Plane-wave lightcone superstring field theory. Class.Quant.Grav., 21. Stefanski, B. (2004). Open spinning strings. JHEP, 0403, p. 23. Stefanski, B. and Pankiewicz, A. (2003). On the uniqueness of plane wave string field theory. p. 15. Stefanski, B. (2003). Open string plane wave light cone superstring field theory. p. 19. Stefanski, B. (2003). Orientifolds, discrete torsion and twisted equivariant K-theory. Class.Quant.Grav., 20. Stefanski, B. and A. Pankiewicz, A. (2003). PP wave light cone superstring field theory. Nucl.Phys., B657, pp. 79–106. Stefanski, B. (2003). Open string plane-wave light cone superstring field theory. Nucl.Phys, B666, pp. 71–78. Stefanski, B. (2002). D-branes, orientifolds and K-theory. Fortsch.Phys., 50, pp. 986–991. Stefanski, B. and Quiroz, N. (2002). Dirichlet branes on orientifolds. Phys.Rev., D66, p. 33. Arutyunov, G., Pankiewicz, A. and Stefanski, B. (2001). Boundary superstring field theory annulus partition function in the presence of tachyons. JHEP, 0106, p. 31. Stefanski, B. (2000). Dirichlet branes on a Calabi-Yau threefold orbifold. Nucl.Phys., B589, pp. 292–314. Dasgupta, T. and Stefanski, B. (2000). NonBPS states and heterotic type I-prime duality. Nucl.Phys., B572, pp. 59–111. Gaberdiel, M.R. and Stefanski, B. (2000). Dirichlet branes on orbifolds. Nucl.Phys., B578, pp. 58–84. Stefanski, B. (1999). Gravitational couplings of D-branes and O-planes. Nucl.Phys., B548, pp. 275–290.